Discover affordable holiday packages to Melbourne from New Zealand. Located only 3 hours 45 minutes from Auckland, Melbourne is the ultimate weekend getaway destination for Kiwis. It's the "cultural capital of Australia" and is home to some of the best local art, films, and live music acts. Is the stress of planning your next holiday getting to you? Keep things simple by grabbing a flight and hotel package deal. Webjet has exclusive holiday package deals that include cheap flights to Melbourne and hotel stays for the duration of your trip. Sit back, relax and let us find the best holiday package deal for your trip to Melbourne from New Zealand. 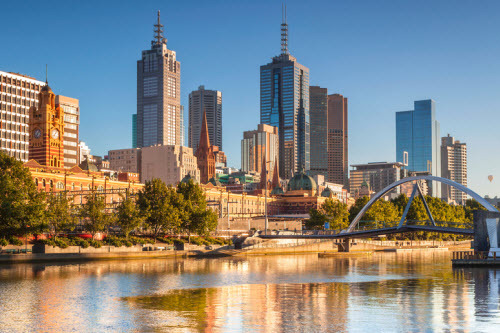 From its historic monuments to modern malls, famous coffee and vibrant culture, Melbourne is renowned for effortlessly blending the past and present. With direct flights from Auckland, Christchurch, Wellington and Queenstown travelling to Melbourne is affordable and will take you only a few hours to arrive. While New Zealand is known for its wine regions, Melbourne still has something to offer intrepid connoisseurs. Head to the famous Yarra Valley and judge for yourself which country has the better wine. For foodies on a budget, Melbourne is a haven. You can pick up pizzas and burgers for under AUD 10, and a meal at a cafe should only set you back around AUD 15. It's arguably one of the cheapest cities to eat in Australia - especially if you love Asian food. Melbourne is home to Australia's largest mall, Chadstone and a plethora of boutique and antique stores. If you're looking to pick up local designer brands like Gorman and Alice McCall, make sure you check-in an empty suitcase. The city also has affordable wildlife activities for families, couples and solo travellers. For only AUD 15 you can catch a ferry to Phillip Island and witness the nightly penguin parade, visit the koala sanctuary and see the massive seal colony basking in the sun. 5. Weather: The best time to visit Melbourne is between September and November and marc and May. You'll find better airfare rates, temperatures will still be warm and you can enjoy the cities top sights without the crowds. The summer months (December to February) are the busiest and June to August is Melbourne's quiet winter season. 6. Getting Around: Take the free yourist shuttle bus that goes around the city. it runs from 10:00am to 4:00pm and goes past some of Melbourne's top attractions. There's also a free tram that goes through the business district and Docklands from 10:00am to 6:00pm. 7. Drinking Water: The tap water in Melbourne is safe to drink. 8. Wi-Fi: There is free and fast public Wi-Fi available in the city centre. All you need to do is select "VicFreeWifFi' and oyu can use 250MB per device per day.